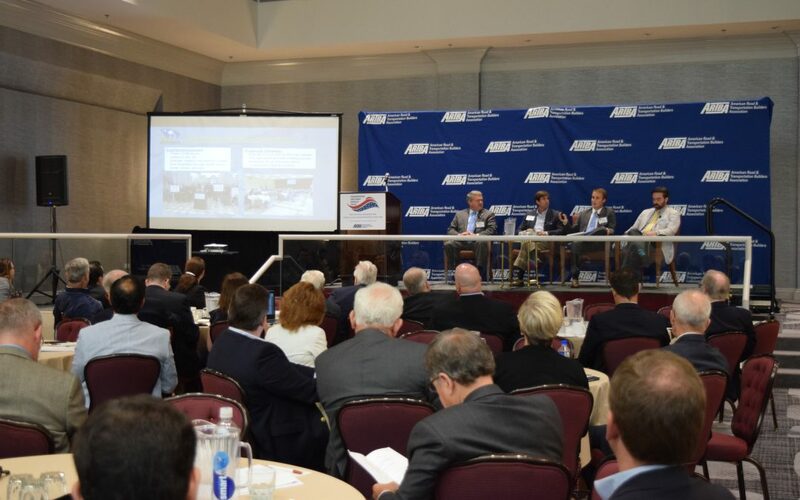 Over 100 transportation investment champions from 30 states joined forces July 13 in the Nation’s Capital for the third annual National Workshop for State & Local Transportation Advocates, a signature program of ARTBA’s Transportation Investment Advocacy Center™ (TIAC). The need to broaden coalitions to gain further support and momentum was a recurring theme of the one-day event. The workshop featured better roads professionals, chamber of commerce executives and public officials with an interest in building support for infrastructure investments locally, and included the annual meeting of the Transportation Investment Advocates Council™. Speakers from 11 states – Mississippi, Alabama, South Carolina, Indiana, Iowa, Nebraska, Arizona, California, South Dakota, North Carolina and Pennsylvania – discussed their experiences, both successful and unsuccessful, in running campaigns to protect or grow transportation funding. ARTBA’s chief economist Dr. Alison Premo Black kicked off the workshop with details on the 26 states that have raised their motor fuel-related taxes since 1997, and recapping the 179 state transportation funding bills introduced in 2015. State action has slowed slightly in 2016, mainly due to the election cycle, but states have introduced 93 transportation funding bills so far this year, Black noted. Attendees learned how to fight back at conservative rhetoric and dispel myths about transportation funding by using ARTBA-supported research that shows officials who support raising the gas tax most often still get re-elected, whether Republican or Democrat. The research shows constituents are overwhelmingly willing to raise their local taxes or fees when they are confident the money will fund transportation improvements. Several groups, including the South Carolina Alliance to Fix Our Roads, Transportation Development Association of Wisconsin, California Alliance for Jobs, Case Construction Equipment’s Dire States program, and 4 Lanes 4 Nebraska, shared their social media messages that have helped to get the public involved in the discussion on the importance of transportation funding. State legislators that provided advice included South Dakota Sen. Mike Vehle (R-District 20), Indiana Rep. Ed Soliday (R-District 4), Nebraska Sen. Jim Smith (R-District 14) and Iowa Sen. Tod Bowman (D-District 29). Many states have taken action due to prolonged inaction at the federal level, but Jeff Loveng, president of America’s Infrastructure Alliance, reminded attendees that finding a clear, long-term transportation funding scheme, including a fix for the Highway Trust Fund, remains the responsibility of the federal government. To find out more about TIAC and see the more than 50 case studies of recent transportation funding campaigns mounted in numerous states, visit www.transportationinvestment.org. TIAC operations are supported by ARTBA’s “Transportation Makes America Work!” program.